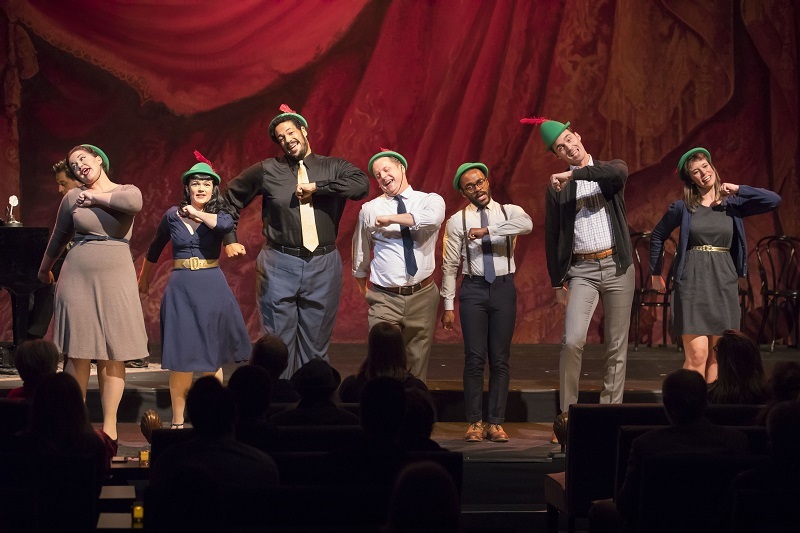 The Lyric Opera and The Second City present LONGER! LOUDER! WAGNER!. I love these mash-ups between The Second City and a Chicago theatre icon. This time, it’s a comedy-opera duet. This show follows-up the very successful “The Second City’s Guide to the Opera”. The roasting tribute to Richard Wagner is a hoot. Whereas the previous show was more in The Second City style with sketches and improv, L!L!W! actually has a storyline. Playwright Tim Sniffen took a clever idea and made it into a sophisticated lampoon. In 1800s, Wagner (played by the hilariously menacing Jesse Case) is struggling to compose “The Ring Cycle.” In contemporary times, his great great grandson Fred (played in dynamic contrast by Tim Ryder) is working on a cupcake opera in Schaumburg. When Germany’s Bayreuth Festival needs a director for “The Ring Cycle,” the brassy Sayjal Joshi (Marguerite) pushes Ryder to Wagner-up. Within these broad storylines, Sniffen neatly layers in plenty of comedy sketches. An arrogant Case explains his “Ring” project at a community theatre workshop. They hate it. Later, he dominates the conversation over coffee with his friends. Randall Harr (Nietzsche) blows up at him for not letting Travis Turner (Liszt) talk about his project. It might sound high-brow but it’s not. No need to be an opera aficionado or intellectual to get the jokes. Even if you don’t know the people or the history, you’ll still get the humor. When Case dramatically orders rose water with a cookie on the side, his delivery is hysterical. Later, the outrageous Turner (now as King Ludwig) arrives on stage carried by Jonah D. Winston. Case, Ryder and Winston are all very tall which Director Anneliese Toft uses to her comedy advantage. In this scene, Winston drops Turner and kisses him on the top of his head. It’s a laugh-out-loud adorable moment. Then, the obsessive Turner flirts with the stoic Case. Meanwhile back in America, Joshi, a classic music commentator is forced to work with Harr, a shock jock. An earnest Joshi interviews Ryder while Harr provides the snarky zingers. Later, the pair effortlessly slip into other personas as in overeager Harr auditions for the ball-busting Joshi. Under Toft’s tight orchestration, this riotous ensemble runs rings around “The Ring Cycle.” The picture above showcases the merry troupe singing at the German festival. The musical numbers add lyrical comedy. And of course, since we are in a world-class opera house, there is powerhouse singing by Tracy Cantin (Valerie) and Jonah D. Winston (Morgan). The classically trained singers join in the comedy too. After Cantin enters the room belting out an aria, she announces she works at Jiffy Lube but saw the audition flier at Whole Foods. Winston, a commanding bass, changes up lyrics to show a softer side. Winston wistfully muses about singing Disney songs. I’m only mentioning a few of the terrific bits. Add in Alice Stanley Jr. as a librarian, Turner as an anti-Wagner and Case as a cross-dresser. The laughs come easy and often in this smart spoof. Act quick to get this show in. There are only six performances. The show is being put on in the exclusive William Mason Rehearsal Hall with cabaret lounge seating. LONGER! LOUDER! WAGNER! is LOL! LMAO! WONDERFUL!